Image: Paula Dawson using Holoshop haptic interface to generate content for digital holographic prints. Holoshop combines innovative technologies and processes for creating real-time 3D digital content for holograms and other 3D display systems, with virtual tools enabling the direct hand-drawing of subjects, mark by mark. The Holoshop project creates the foundations for a new method of 3D content creation that factors the key perceptual differences between the level and type of detail required of a two-dimensional or three-dimensional media into a process of 3D line drawing construction. 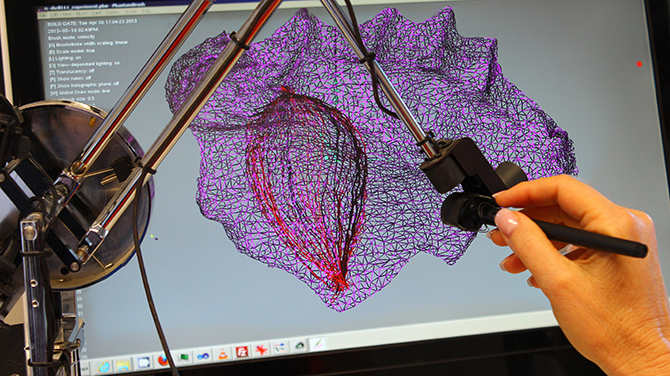 Using a haptic (tactile) interface, Holoshop software registers the users’ gestures as a digital 3D scene. This software enables three-dimensional templates made in other softwares to be imported and used as guides for drawing. It also enables aesthetic choices such as colour and line, and can be modified to track gestural inputs such as speed. In this forum, chaired by ISEA2013 Keynote Professor Brian Rogers, investigators and researchers of the Holoshop project will discuss the development and perceptual effects of Holoshop. Detailing the development of the project across varied platforms, the speakers will compare the unique perceptual effects created by Holoshop software across holographic, three-dimensional, stereoscopic and virtual mediums. Professor Brian Rogers teaches in the Department of Experimental Psychology at the University of Oxford. He is acknowledged as one of the foremost experts on 3D perception. In his research he has shown that motion parallax can be as effective as binocular disparities as a source of 3D information, and recently he has been studying how the many different sources of 3D information interact and combine to create the perception of 3D structure and layout. Within Holoshop, he advises on the effectiveness of research progress across a range of 3D platforms’ display systems – stereo, structure-from-motion, CGH and holo-video – assessing their advantages and disadvantages. He is also involved in the design of data collection and collation from visitor participation with the Holoshop: Drawing and Perceiving in Depthexhibition and workshops for ISEA2013. Associate Professor Masa Takatsuka teaches at VisLAB, School of IT, University of Sydney. He has pioneered the development of neural networks for encoding individual characteristics of objects, including free-form surfaces, which are particularly relevant to this project. He has also developed a texture-based 3D shape encoding technique that utilises the geometric shading technology available in recent Graphical Processing Units, and oversees the design and development of computational algorithms and software design which enable Holoshop haptic interface to be used for virtual drawing purposes. Professor Hiroshi Yoshikawa teaches at Nihon University, Japan. He is an expert in high-speed calculation on computer-generated holograms. With pixel number exceeding 100 billion for a 150 mm x 150 mm hologram, his skills in fast calculation are crucial to the generation of such huge holograms for the Holoshop project. He also adapts the mathematical generation of the holographic fringe pattern of virtual drawings to match the parameters for electrobeam lithography at the Australian National Fabrication Facility, University of New South Wales. Dr Joanna Szymanska is a highly skilled nano-fabrication engineer at the Australian National Fabrication Facility, UNSW. She has developed a process of creating computer generated holograms (CGH) using electron beam lithography, and has successfully written several CGHs. One of them, 3 x 3mm in size, will be shown in the Holoshop: Drawing and Perceiving in Depth exhibition for ISEA2013. Dr John Stavrakakis is a specialist in 3D computer graphics and networking at VisLAB School of IT, University of Sydney, and holds a PhD in Computer Science from the University of Sydney. John has broad technical skills used in projects that pursue the educational, research and industrial application of technologies. He is currently developing the Holoshop software supporting the use of haptic devices and visual feedback. Phillip Lange, Visual Effects Compositor is a Visual Effects Compositor based in Sydney with over a decade of experience working on feature films and television projects. He has worked both locally and internationally and most recently on Great Gatsby, Harry Potter and the Deathly Hollows, and Happy Feet 2. Karen Kriss, Lecturer College of Fine Arts, UNSW teaches at the College of Fine Arts,UNSW and has as worked as a Visual Effects producer and Animator on feature films and short animation productions in Sydney, Montreal, Toronto and Los Angeles including award winning films Happy Feet and Lust Caution. She is undertaking research with a Master of Fine Arts at the College of Fine Arts, UNSW. Karen Kriss teaches at the College of Fine Arts, UNSW and has as worked as a Visual Effects producer and Animator on feature films and short animation productions in Sydney, Montreal, Toronto and Los Angeles, including award winning films Happy Feet and Lust Caution. She is currently undertaking research for a Master of Fine Arts at the College of Fine Arts, UNSW.